I am reading about new features in Visual Studio 9.0 (Orcas) (while I am playing with it :) ) and I found there is a new feature in Visual Basic called Relaxed Delegates. 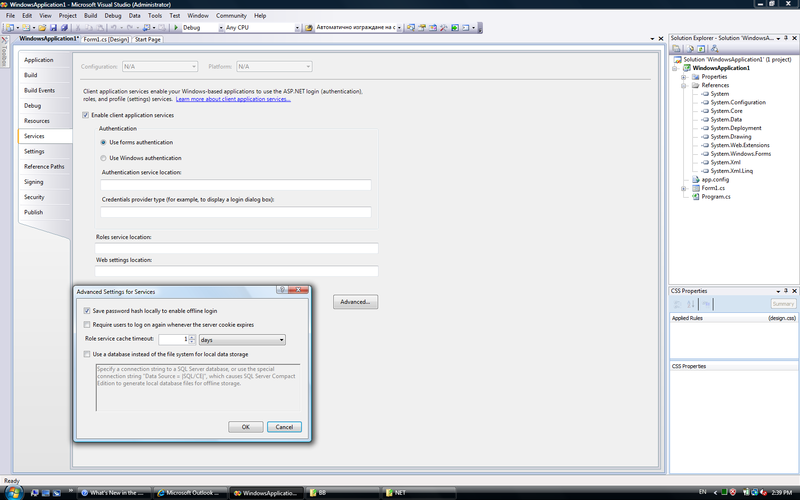 ASP.NET Authentication is very nice and could save a lot of time. Yes, although it covers many cases according Murphy laws you'll need that one that is not covered :). Fortunately there is a way to extend ASP.NET Authentication in order to include all you need. Or even build entirely custom autentication module that works fine with ASP.NET login controls. But when you want to use single authentication for Windows form and Web applications and decide to use built in ASP.NET Authentication then you will have to write a lot code. More will be covered soon. C# IDE Chat: Code snippets, enhanced IntelliSense, type colorization, refactoring, improved code navigation, metadata as source, Edit and Continue! There are so many great new C# IDE features in Visual Studio 2005 - there's a lot to talk about! Or perhaps you have a question about Visual Studio 2003 or what we're planning for the next version? It's your choice! Join the C# IDE team for a chat completely directed by your questions. C# Language Chat. Want to know more about anonymous delegates in C# 2.0, or our design rationale for them? Have some questions about our current thinking on C# 3.0 and LINQ? Perhaps you'd like to share your ideas with other C# users or the C# language team. Join the C# team for all that and more! The LINQ Project is a codename for a set of extensions to the .NET Framework that encompass language-integrated query, set, and transform operations. LINQ to SQL is a component of LINQ which allows access to data stored in relational databases. We’re actively designing and developing this technology - show up and join the LINQ to SQL team to participate in that process or just get a better understanding! Is has been a long time since my last update on LINQ tutorial. Last two months has been busier than I expected. This week I found some time I could announce with pride that next part is done and published -LINQ Tutorial - Expression Trees. As there are many resources for English speaking devs this article target Bulgarian speaking audience. As always: your feedback is highly appreciated. Well this is possible - see example here. It seems this have very good potential in current Web 2.0 wave. Each assembly defines which namespaces will be filtered in. Each class in these namespaces mustScriptAttribute, to be opt-in for jsc compilation. Therefore, previously built assamblies will not define be processed. » What is the current status? Currently, the jsc project is non-commercial, unsupported and experimental , but free to use :) If any of you manage to create something others would like to see with this, be it java games or ajax apps, post a comment on the blog. » Who would like to use it? operator ?? is not supported. return within try catch finally is not supported. try handler filter is not supported. ref out is not supported. Today MS signed off on the Beta 1 release for Visual Studio “Orcas” and .NET FX 3.5. Michael Platt wrote: "Architects are a lot slower in getting a solution, especially if the problem is simple!". Probably we could add that "Architects are much likely to come up with complex and costly solutions, especially if the problem is simple!". I wont discuss how this is done but let's say it is quite difficult to let this out from the stakeholders (point 1 and 4). because software industry is much younger and technologies are changing ( and constantly lowering development cost and time). But let's back to paragraph above: Why Architects should create much complex solutions!? Based on their experience they would try to guess future needs and cover them. This is the only explanation I have... But ( in opinion again ) I think customer/stakeholders should known main decisions taken regarding solution built for them. In this case they will be told all main assumptions and constraints. Knowing these ( as well as how important it is represented by time and money :) ) they will closely involved in defining goals and scope. I agree that architects, based on their experience, would notice much more details and would have much more questions to stakeholders. But this doesn't make solution more complex or expensive. This makes goals much clearer and allows setting good solution architecture as well as avoids changes in later stages. Indeed, an architect can have to write lines of code (at least to create prototypes or mock-ups), but also has to get his hands dirty with code to validate the quality of what is produced or resolve a particularly technically difficult situation. About this paragraph I absolutely agree :) Definitely the architects should be able understand and influence what 's done by developers and even could be able to participate in first stages of development. But not too close because pure developers won't have the chance to take design decisions on certain levels of solution and would be obstacle to for them in gaining valuable experience. So what are we - Architects or Developers?! By being the person who gets the project, and make it happens, are we developers because we are highly involved in implementation/code phase or we are architects because we do much more things beside implementation? Assemblies of next version of .NET Framework are divided in two groups - "green bits" and "red bits" as they are called inside Microsoft. The red bits include all the libraries that shipped before as part of the .NET Framework 2.0 and 3.0 (such as mscorlib.dll and system.dll). To maintain a high assurance of backward compatibility for Visual Studio "Orcas," changes in the red bits have been greatly limited. The green bits assemblies are the brand new libraries with additional classes that work on top of the red bits assemblies. Most of the classes listed in this column are in the green bits assemblies (such as system.core.dll), with a few involving limited changes in the red bits assemblies. There are also new crypto classes that covers Suite B set of cryptographic algorithms. for more info read New Library Classes in "Orcas"
In the April/May time frame there will be three public chats by the C# Team. April 23, 2007, 11 AM Pacific Time C# Visual Studio IDE Chat: Talk about C# IntelliSense for LINQ. Discuss what else is planned for Visual Studio Orcas. Plus: Code snippets, enhanced IntelliSense, type colorization, refactoring, improved code navigation, metadata as source, Edit and Continue and all the other great new C# IDE features in Visual Studio 2005. There's a lot to talk about! It's your choice! Join the C# IDE team for a chat completely directed by your questions. May 7, 2007, 11 AM Pacific Time Compiler and Language Chat: C# Language Chat. Want to know more about anonymous delegates in C# 2.0, or our design rationale for them? Have some questions about our current thinking on C# 3.0 and LINQ? Perhaps you'd like to share your ideas with other C# users or the C# language team. Join the C# team chat for an opportunity to do all that and more! May 21 2007, 11 AM Pacific Time LINQ to SQL Chat: The LINQ Project is a part of the next version of Visual Studio, code named Orcas. LINQ will provide a set of extensions to the .NET Framework that encompass language-integrated query, set, and transform operations. LINQ to SQL is a component of LINQ which allows access to data stored in relational databases. We’re actively designing and developing this technology - show up and join the LINQ to SQL team to participate in that process or just get a better understanding!